After an extremely difficult year for our team, we are excited to get to play Destination: Deep Space in a few days! Cosmo will be playing at Hudson Valley, SBPLI #2, & NYC Regional. Thank you to all of our family, friends, and sponsors who made Cosmo possible. Slick as always. Just curious, how does the hatch mech work? I see there’s a velcro roller for a ground pickup, but there must be something else I’m missing. Either way, excited to see it in person this weekend! What do they use for the drive train chain or belts? We have a eight wheel (two omni wheels in the front and six colson wheels in the back) run by four NEO Motors and two Mini-CIM motors. They are connected to their gearboxes via chains. We’ve just had more reliability with them, and have it is easier for us to work with for our drive. I was just wondering for next year if our team would use belts and with fine tuning in programming can be smoother and faster than chain. are all 6 colsons at the same height? if so, have you guys experienced any problems when turning? or do you guys have a center drop on the middle 4 wheels? It is tucked away by a cylinder in the photo, but here is a photo of it in action. It extends out over the bumper when we are handling hatches. Chains and belts are functionally equivalent when they are both properly tensioned. Each have their own pros and cons such as weight and so on, but your robot will not faster or more accurate just by switching between chain and belt or vice versa. Honestly the reason we use chain is we have more experience and are more comfortable with them. We used versa blocks from vex to keep them tensioned and are happy because they are something we never have to worry about. We do not have the machining capabilities to accurately make C-C distances for belt and feel that if a versablock cam loosens a little, it’s just that a loose chain that we can quickly tighten during post-match checks. An equally loose versablock with belt can lead to a skipping belt and poor match performance. There are plenty of ways to mitigate this but at the end of the day we mainly choose chain because of more experience with it. As for cad, we have a 6 student dedicated cad team, led by a remote mentor. Other build students jump in and cad items when necessary as well. We use Inventor for almost everything. Sometimes a part will be made in solidworks. We might be switching over to solidworks soon though. We used the same style for our drive as we did last year since it was another elevator game and we liked the stability we got from it last year when the elevator was up. We start with a 8wd with an 1/8" center drop on the two center wheels (the colsons) using versablocks. We then take the 2nd wheel from the front (the first colson) and shave it on a lathe to bring the first 3 wheels level with each other. The back colson becomes the only wheel raised, by an 1/8". 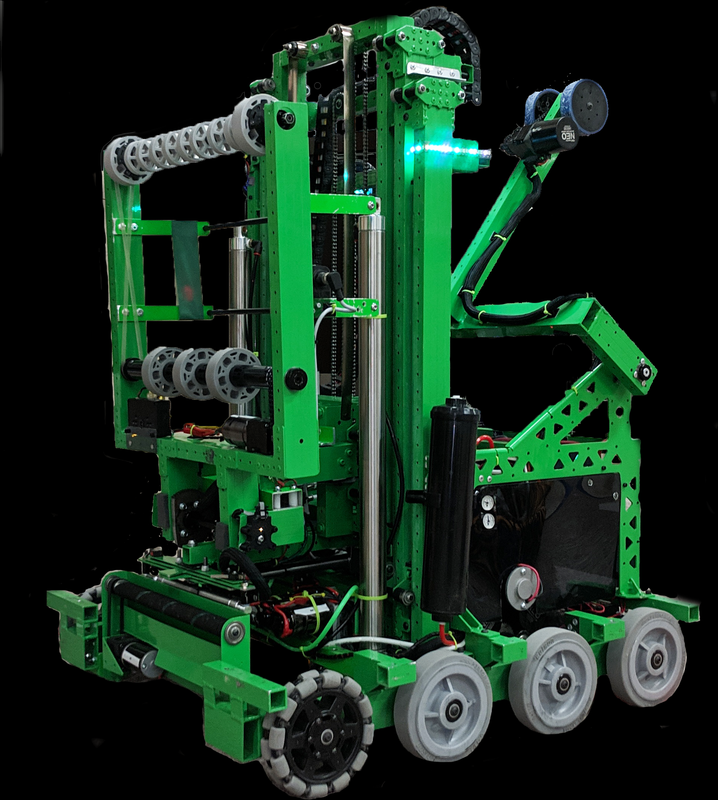 Great looking robot this year!! We have not experimented with the Neo’s yet. What is the idea behind mixing Neo’s with Mini-CIMS? We plan to do some NEO testing during the off season. We were not completely happy with the software side of the neo’s, but thought their power was valuable so we chose to run 2 neo’s/1 mini per gearbox. This allowed us to run our grayhill encoders directly to the SRX for the minicim on each side and then set the neo’s to follow that mini-cim. It was just easier and more familiar for our programmers. This allowed them to create the full auto’s that you see during the sandstorm period. We were a bit afraid to venture into the unknown of Neo’s this year. Thanks to you and others for blazing the trail! Your Auton looks sweet and accurate. I’m guessing that you are using a combination of Gyro, Encoders, and Limelight? 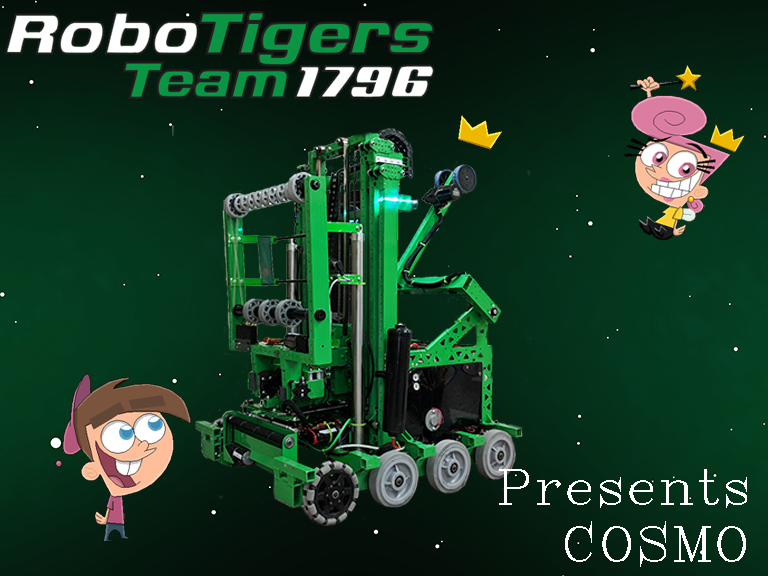 We are excited to see Cosmo in real life at SBPLI #2! Cosmo seems “scary” fast!! Another great robot from 1796. I hope next year you can make a trip upstate to compete – imagine seeing 2791 and 1796 team up this year (or any year in the last few years…). Good luck at your next two events, I’ll be excited to see the robot at champs. You are correct, we are using a nav-X, grayhill encoders on the drive, and the limelight for the auto this year. your robot looks great this year. We had a great qual match together! Thank you, we are barely making the short trip to HVR work right now but you never know! 2791’s robot looks amazing and it would a sight to see our drivers zipping around together. Good luck at championships! Thank you for partnering with us (870) at SBPLI#2!!! Too close for comfort on the scores. Best of luck at NYC! We are hoping to see another Blue Banner from you there. Hope to see you in Detroit. The hatch panel slides are attached to a 6" stroke 3/4" bore cylinder. The whole mechanism is attached to a 7" stroke 3/4" bore cylinder that extends it out over the bumper when retrieving and delivering hatches.